Have you ever had that pipe that just wouldn’t give you the vertical clearance you need. I mean “just give me 3….. more…. inches!!!!!”. In the image above, you should see that I have changed the Vertical Pipe Clearance to 6″. I did this through XML. 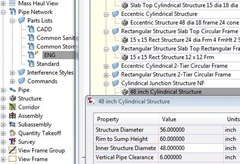 That Vertical Pipe Clearance value is a function of the Parts builder, and is used as part of the Pipe Network Catalog. Those parameters are stored in an XML file.Now Everybody loves Part Builder, right? Let’s face it, anything that will allow us to build parametric parts without being a programmer and mechanical engineer, must be great. It is! However, the Part Building process is not exactly ‘user friendly’. If you have the time to go through the learning curve of the parts builder, then I highly suggest it. There is a lot of customization in there just waiting to be utilized. However, you most likely don’t have that luxury right now. I’d like to show you, through the magic of XML, how to modify that setting, WITHOUT the parts builder. The example I want to illustrate with is the installed pipe structure ‘Cylindrical Junction Structure NF’ that should come with a Vertical Pipe Clearance of 12″. The following relates to that structure, but you may need to look into another structure that is the thorn in your side. You can change the value here and it be available (after swap part) in the dwg. Please note that I have only tested this in 2009 briefly. Please Backup your catalogs, and your drawings before trying this. Drop a post and let us know how things go.